Custom Rainbow Prayer Flag. All proceeds to families in Mexico. Free domestic shipping. 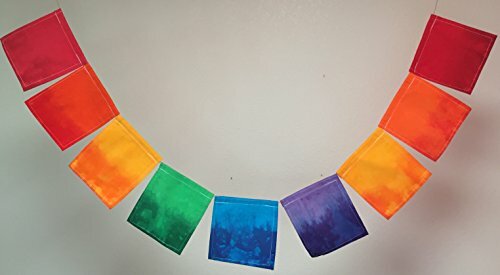 We can custom make any of our prayer flags in combinations of nine panels in any the colors we dye -Chinese Red, Deep Orange, Golden Yellow, Bright Green, Turquoise, or Plum (purple). Please send us a conversation telling us which strand of prayer flags you would like (for example, Tree of Life or Beatitudes). Please allow 10 days for us to ship custom orders. This price ($24) is the price for having one of the themes offered in our shop stamped onto this strand of prayer flags. If you would like this strand of prayer flags left blank for your own customization, the price will be $18 and we will issue a refund to your account for the difference. 100% proceeds go to families in Mexico that work on the prayer flags. These flags are part of a community development project supporting women and families in Juarez, Mexico, a city ravaged by poverty and violent crime. There are 9 flags (5.5'' by 6.5''); the strand is about 54'' long, in vibrant colors. Great for indoor or outdoor display. Each step of this process employs women, several of whom cannot work outside the home because they care special-needs children.This project is truly changing lives and the flags make a great gift. If you have any questions about this product by Guerilla Prayer Flags, contact us by completing and submitting the form below. If you are looking for a specif part number, please include it with your message. Counted Cross Stitch Kit. Oh for fox sake.